I talked about bitter life, better man previously. Somehow someone commented I wasn't "better" enough, well, one must know that sometimes one can stand tough on the struggles on him or her but just can't see the loved one get hurt by even a single mosquito bite. Perhaps, she must not have learned how to love and hence can't understand. :P Anyhow, I "accepted" the comment and I went ahead to get myself "bitterer" (got such word?! Haha!) so I can be even "betterer" (??!! ), if not become the best. You may already know about this restaurant from one of the media listed on the menu. The dishes were good except the pork. The pork in bamboo was really bad with strong disgusting pork smell. Some commented that I am too fussy (to pork), I admit that 'cause I have been eating pork for my entire life (sound very old hor?? ), like Bah Kut Teh and Pai Kut Rice, I know if the pork is fresh and if it's the high grade pork with a small bite or even smell at the dish. Nevertheless, other dishes were cooked perfectly that the bitter gourd taste was retained. Jalan 23/15. GPS coordinate N3 06.992 E101 36.765. 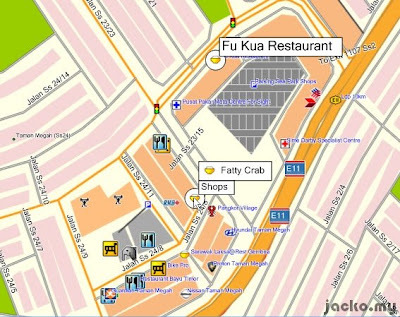 Somewhere near Fatty Crab. It's in the MFM map.